Photographs courtesy of Richard Carey. The Coxcomb Range highpoint identity was in dispute owing to obvious errors in the USGS chart. Richard Carey had long wanted a revisit with an accurate surveying tool to this end. Edward Earl and I joined Richard over 1 1/4 days, beginning the effort from parked cars along Highway 62. We backpacked in 2+ hours to a camp at the base of the entrance gully; erected our tent (Richard brought a bivvy sack); and climbed over excessively rough, rocky terrain to the summit of Spectre. 4x zoom with a true bearing of 77°. Aqua is clearly lower than both Spectre and Dyadic. The approach to Spectre is from the north, passing over the northwest ramparts of BM Aqua. Spectre itself is climbed from the east, with some slabs negotiated followed by Class 3 scrambling. Spectre is shown on the USGS chart as supporting only a 1,300 meter contour. Our survey demonstrates that BM Aqua, some 1,600 feet to the north northeast, is considerably lower than Spectre - by our estimates some sixty feet lower. BM Aqua, known also as "Tensor", is shown on the 24,000:1 chart as 1,346.5 meters = 4,418 feet. Richard's GPS unit read 4,419 feet at its summit. BM Dyadic is immediately east of Spectre and by our estimate is Class 4. We determined it to be 4-5 feet lower than Spectre through accurate use of a transit device. Tensor and dyadic are mathematical concepts that somehow crept into the nomenclature of these assorted summits. Future peakbaggers need only climb Spectre to claim the range highpoint. 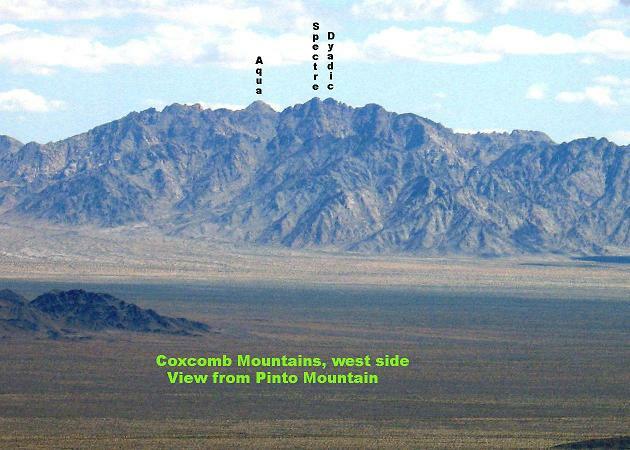 With an elevation of 4,480 feet, Spectre's prominence (and that of the Coxcomb Range) is reset to 2,544 feet. We left camp at 10:53 a.m. and returned 6 1/2 hours later. 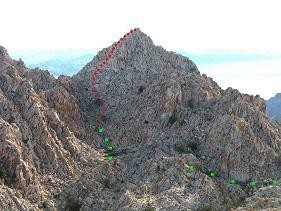 This includes a thirty minute ascent of BM Aqua by Edward and Richard from a nearby saddle (with 200 feet of gain). our approach as green squares. I enjoyed an enormous baked potato at dinner that night - precooked at home so that it merely needed reheating in my cookpot. It was enjoyed with herb goat cheese and fresh tarragon; a relish purchased in Santiago, Chile the previous month after the Aconcagua climb; and chicken shish kebab in a sweet glaze. Deserts included lemon tortuffo with a sponge cake base (great with a Ferro Rocher chocolate hazelnut bonbon); and a chocolate marble halvah offered by Richard from Trader Joe's. It is the best halvah I have ever enjoyed! A dark chocolate bark surrounds the halvah itself. The following morning I enjoyed more halvah with hot coffee and chocolate chip cookies instead of having the blueberry cream oatmeal originally planned upon. The ruby red grapefruit was also yummy. Our hike out consumed 1 hour 31 minutes. Richard continued to nearby Iron Mountain; Edward and I returned to San Diego. Our effort could have been done in one long day instead of backpacking. We overnighted because of concerns that the surveying gear would make for slower travel.